The SEER rating, purchasing the right size unit for your home, and contacting a skilled dealer that can help you determine the air conditioning system that�s right for you and your home. SEER stands for Seasonal Energy Efficiency Ratio. This measures and gives you an indication of the performance efficiency of the system. The higher the SEER, the more efficient the unit. The greater the energy efficiency, the lower your operating costs. How do I know when enough is enough when it comes to size? It takes more than just knowing the size of your home. 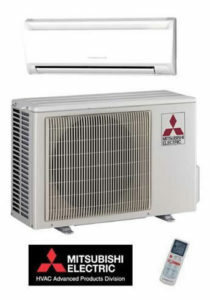 An air conditioner that�s too large will probably cost more to purchase, have higher operating costs and will not give you the comfort you are looking for. Why? If the unit is too large, it cools your home faster but it will not remove the humidity from the air leaving you less comfortable in the long run. Choosing a unit that is too small will not have the capacity to cool your home. After running nonstop all day long it may never reach the desired temperature. This costs you money and a comfortable home. COMFORT WITHOUT COMPROMISE IN ANY ROOM YOU WANT...Mitsubishi heating and cooling systems offer efficient, individual room control with no ductwork.